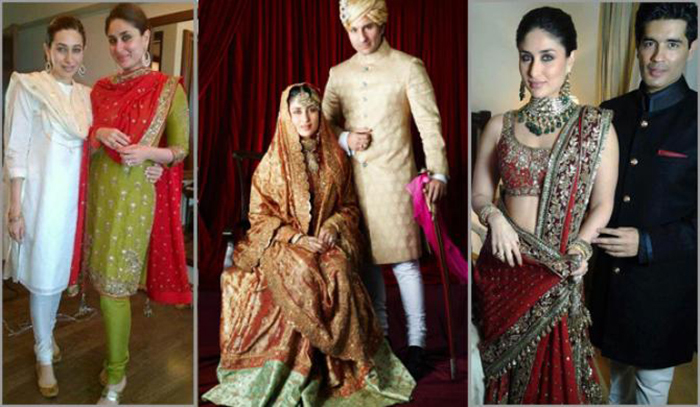 The lovebirds of Bollywood industry, Kareena Kapoor and Saif Ali Khan looked picture perfect on their hush-hush wedding. 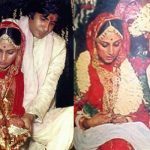 The Bollywood biggies Aishwarya Rai and Abhishek Bachchan looked exotic on their Big-Day and these pictures surely tell the saga of their grand affair. 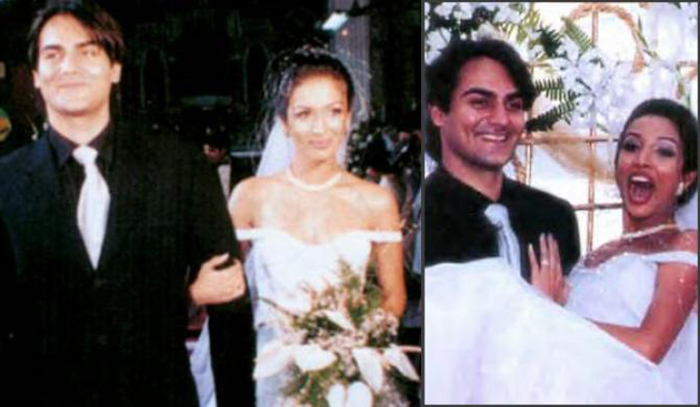 Malaika Arora and Arbaaz Khan, the hot couple of the 1990s looked like a charming prince with her beautiful princess on their wedding. 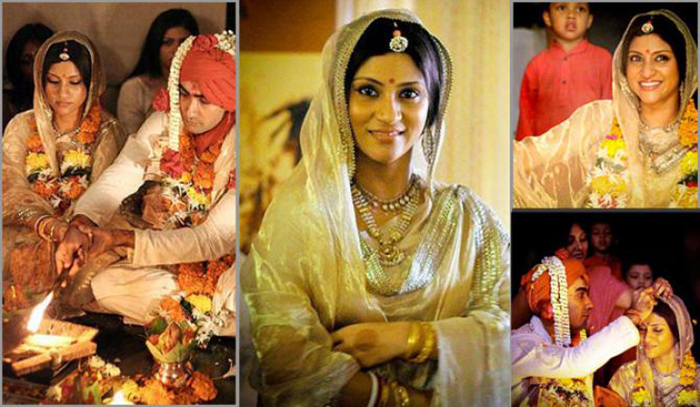 The Bengoli beauty Konkana Sen wore her grandmother’s jewellery on her wedding day. The wedding ceremonies took place at Ranbir’s Malad apartment and they both kept it quite simple. 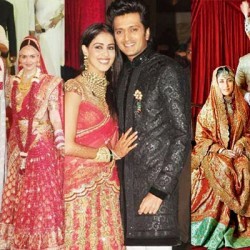 The cutest couple of Bollywood, Genelia D’Souza and Ritesh Deshmukh had a big fat Marathi wedding followed by a Christian wedding. 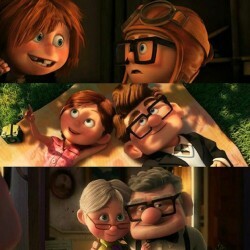 The couple looked stunning in both the avatars. 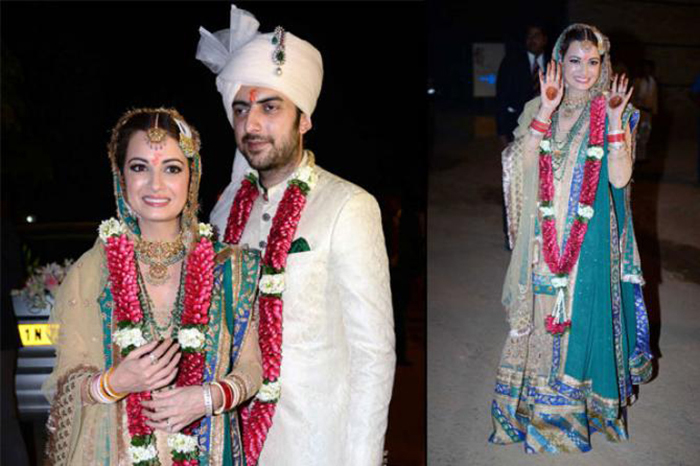 Diya Mirza dazzled in a beige and green sharara designed by Ritu Kumar on her wedding with beau and business partner, Sahil Sangha. Hema Malini and Dharmendra’s elder daughter, Esha Deol got hitched to Bandra-based businessman, Bharat Takhtani at ISKCON temple. 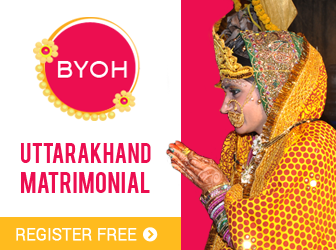 She wore an embellished red colour lehenga on her wedding day which is considered to be auspicious. 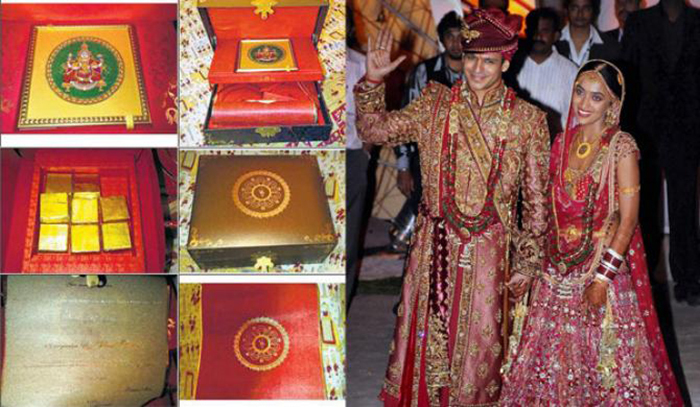 The Bollywood heart-throb Vivek Oberoi and Priyanka Alva’s wedding is amongst the most expensive Bollywood weddings. Their designer ensemble, lavish venues and even their wedding cards became the talk of the B-town. 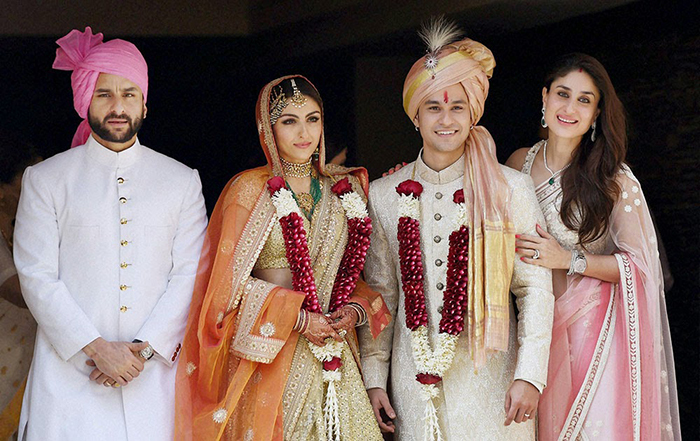 The beloved princess of the nawabi gharana, Soha Ali Khan married her long-time beau and actor, Kunal Khemu on January 25, 2015. 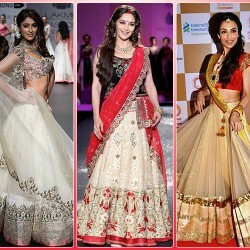 Soha looked ravishing in a designer golden lehenga. 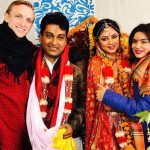 It was a low-key affair and the couple exchanged the vows in the presence of a registrar and the family members. The country’s most desirable woman, Shilpa Shetty’s wedding with London-based businessman Raj Kundra is one of the lavish celebs weddings. Shilpa looked stunning in a designer lehenga by Tarun Tahiliani. 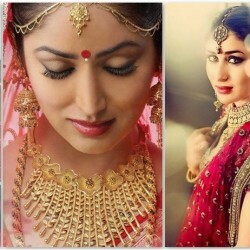 It is said that her wedding saree had red Swarovski crystals embedded worth Rs 50 lakh and her kundan jewellery with uncut diamonds and emeralds cost around Rs 3 crores. Asin married her beau, Rahul Sharma, the co-founder of Micromax Informatics in a Hindu and Christian wedding ceremony. 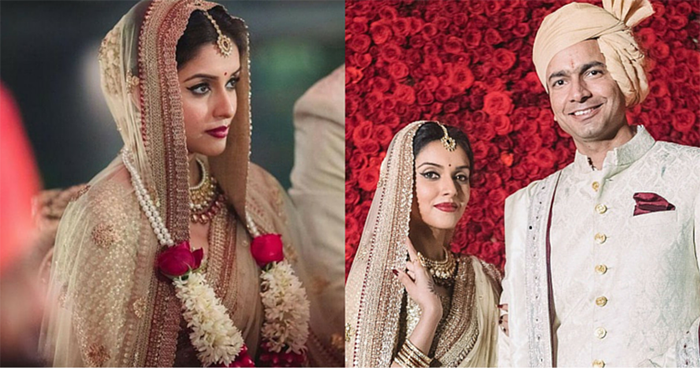 Asin looked dropped dead gorgeous on her Big day. 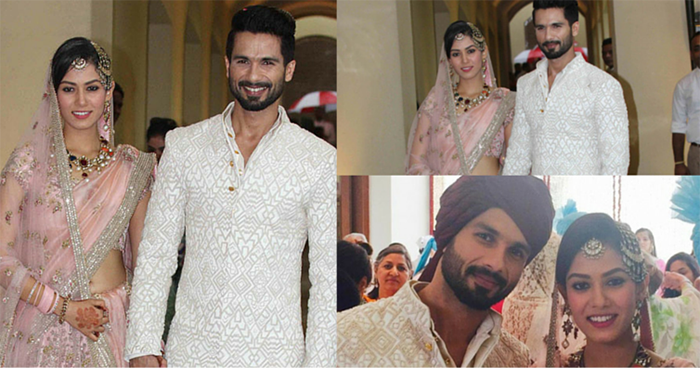 Shahid Kapoor had a low key Gurudwara wedding with Delhi girl, Mira Rajput. The blushing bride, Mira Rajput looked beautiful adorning a rose-hued Anamika Khanna outfit with a statement necklace and heavy earrings. While Shahid looked suave sporting a white Sherwani.